NJDOT has begun much-needed road improvements on Route 70, and for the next several weeks, motorists in Cherry Hill will see crews along portions of the highway both during the day and at night. throughout the week next week, with crews scheduled Daytime crews have been dispatched to complete concrete work and curb repairs, while I'm happy to report that the bulk of milling and paving will be completed during the overnight hours, from 9 p.m. to 6 a.m., to minimize impact to nearby neighborhoods, businesses and commuters. As always, work is weather-dependent. Work is expected to be complete in the fall of 2017, and will significantly improve driving conditions on the highway. This is a maintenance contract for surface repairs, and not a full reconstruction of the road. NJDOT expects to complete a larger, $30 million project in 2020 to reconstruct Route 70 through the Township. 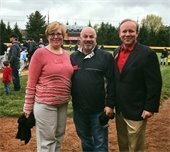 Council members Carole Roskoph, Jim Bannar and Dave Fleisher joined Cherry Hill Atlantic Little League to celebrate the start of their season on April 23. Despite a blustery morning last Saturday, the sights and sounds of summer were in the air as our Council members joined players and coaches with Cherry Hill Atlantic Little League to celebrate the start of the 2017 season. From the team introductions and parade, to carnival games and food, to a visit from special guest the Phillie Phanatic, it was a wonderful morning to enjoy a great community tradition with hundreds of Cherry Hill families. Thank you to Atlantic's Board members, coaches and players for inviting us to join in the festivities; we wish you all a successful, fun-filled season! Click here for photos. Registration is now open for summer classes and programs offered through the Township's Recreation Department, including the popular Morning Fun Summer Camp and Morning Fun Drama programs. All of this year's programs are available for online registration, including, for the first time, both summer camp programs! 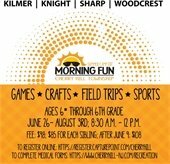 Morning Fun is open to children ages 6 through 6th grade, and includes weekly field trips to destinations across Cherry Hill. An early-bird rate of $98 ($85 for each sibling) is in effect for families who register by June 9. To take a look at all of this summer's Recreation programs and classes, visit the CommunityPass online registration portal. For more information, contact the Recreation Department at (856) 488-7868, or e-mail Recreation@chtownship.com. 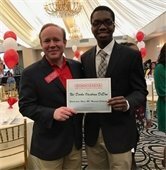 Councll President Dave Fleisher with Nii-Darku O. DoDoo, recipient of the Yolanda Jones-Mapp, MD, Memorial Scholarship. Council President David Fleisher and Councilwoman Carolyn Jacobs joined the Cherry Hill African American Civic Association for their annual Cherry Blossom Scholarship Luncheon last Saturday at the Crowne Plaza Hotel. The annual event honors some of Cherry Hill's brightest young students, while raising funds to continue the organization's scholarship programs. Congratulations to all of the inspiring young men and women honored last weekend; our future is truly bright! Click here for photos from the luncheon. The Township has resumed work on the 2016 Road Maintenance Program. Spring means the Township is moving full-speed ahead with investments to our roads, parks, playgrounds and public facilities across Cherry Hill. 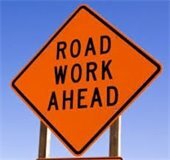 Next week, the Township's Engineering Department will continue road work as part of the 2016 Road Maintenance Program, with final paving and line striping scheduled on Heartwood Road, Hurff Avenue and West Valleybrook Drive. All work is weather-dependent. For more information, contact the Engineering Department at (856) 424-3203. These are just two of many projects in the pipeline this spring and summer, including improvements to a number of municipal tennis, hockey and basketball facilities across Cherry Hill, additional road improvements, and more. Council and I are committed to these projects, which improve the quality of life in our neighborhoods, and I look forward to sharing updates with you in the weeks and months to come. Council members, community leaders and Babe Ruth baseball players honored Charlie Foulke Jr. on Earth Day, April 22. Community leaders honor longtime businessman Charlie Foulke Jr.
Our Council members honored longtime Cherry Hill resident, businessman and philanthropist Charlie Foulke Jr. last weekend, to mark the 50th anniversary of his Cherry Hill Triplex car dealership. In celebration of the Triplex's Golden Anniversary, Foulke and his family donated 50 trees, which were planted on Earth Day around the perimeter of Foulke Field, the Babe Ruth field at Mercer St. and Graham Ave. Several community leaders were on hand for the event, including our Council members Dave Fleisher, Sara Lipsett, Brian Bauerle, Carole Roskoph, and Melinda Kane, NJ Senate President Steve Sweeney, Sen. Fred Madden, Sen. Jim Beach, Freeholder-Director Lou Greenwald, and members of the Foulke family. Thank you to the Foulke family for their continued philanthropy and generosity within our community - and congratulations to Charlie Foulke Jr. on 50 years of business! Council members Dave Fleisher, Carolyn Jacobs and Carole Roskoph celebrated St. Thomas Greek Church's 50th anniversary. Council members Dave Fleisher, Carole Roskoph and Carolyn Jacobs were honored to join hundreds of members of St. Thomas Greek Orthodox Church last Sunday to celebrate St. Thomas Day, and mark the 50th anniversary of the church on Mercer St. St. Thomas was founded by a small group of Greek Orthodox residents from South Jersey who saw a need for a church to serve the Philadelphia suburbs. Enthusiasm for the idea grew, and ground was broken on the church in May 1966; the church opened its doors in October 1967. Today, St. Thomas is a wonderful community partner, and a thriving piece of our Cherry Hill faith community. Annual events such as the Greek Agora, and smaller community celebrations such as the Greek Independence Day observance at Town Hall, have cemented the church's special place in Cherry Hill - and we were proud to join with the congregation, clergy and parish council in celebrating its Golden Anniversary! The Cherry Hill Fire Department will once again offer its annual Lifeguard Refresher Program. The dates are Saturday, May 13, or Sunday, May 21, from 6 to 8:30 p.m. For more information and to register, please click here. The date is upon us! As our Township, school district and Sustainable Cherry Hill get ready for tomorrow's Earth Festival at Croft Farm, be sure to plan your day to celebrate, learn, grow and be good to the Earth! Warm-Up Events: FREE yoga at 8:15 a.m. and Tai Chi at 10:15 a.m., led by LourdesCare’s Michele Carlino. Bring your mat; sessions are all-weather. Create a Love Your Earth message: Led by local artist Suzy Sherbine and Sustainable Cherry Hill. Upcycle, donate and recycle: Drop-off and donate near the main Croft Farm driveway; bring wire hangars (no dry-cleaning plastic); plastic shopping/grocery bags (courtesy Ravitz Shoprite); rechargeable AAA, AA, D, C, 9V batteries; gently worn shoes (pairs only); small, non-powered hand tools for Camden County Tool Library; donations for the Cherry Hill Food Pantry and Food Bank of South Jersey booths; gently used books for the Cherry Hill Library booth. Plant swap: Bring your excess garden perennials and take home new varieties and some FREE compost in your container, or buy new plants and vegetables. Entertainment: Two stages of free entertainment, plus the Phillie Phanatic during the noon hour; East Cougar and West Lion all day! Visit Cherry Hill’s Art Blooms Juried Art Exhibit: In its last weekend at the Arts Center (closes April 30). Don't miss the largest eco-event in South Jersey! Check out video of Mayor Cahn and festival producer Brenda Jorett talking about the event on NBC10 earlier this week. For more festival information, go to www.SustainableCherryHill.org, or contact festival producer Brenda Jorett. Produced with support from presenting sponsors: LourdesCare of Cherry Hill, Ravitz Family Markets and Hutchinson Plumbing, Heating Cooling. Follow us on Twitter @SCHEarthFest. Mayor Cahn and his wife, Stephanie, pose with the Trio Montage after their show at Croft Farm. Did you know that the Township is home to one of the region's best, intimate performance spaces? The Croft Farm Arts Center, located on the grounds of 18th-century Croft Farm, plays host to dozens of live performances throughout the year - including our next installment of the annual Ensemble Series. A former tractor barn, the Arts Center was converted in 1995 to an intimate, 200-seat performance venue with wonderful acoustics. Come check it out for yourself! Our next Ensemble Concert will take place on Sunday, April 30, featuring the "Romantic Music of Europe," as performed by members of the Ocean City Pops. Click here for more information. Purchase tickets online: https://register.capturepoint.com/cherryhill. The 2016-17 Ensemble Series at Croft Farm is brought to you by MD Anderson Cancer Center at Cooper. The Arts Center has become a cultural haven for many Cherry Hill residents, providing “big-city” entertainment without all the hassle of bridge tolls, parking and big-city prices. For more information, contact the Recreation Department at (856) 488-7868, or e-mail Arts@chtownship.com. Please join us for a wonderful evening of family entertainment at 7 p.m. Sunday, April 30, at Cherry Hill High School West. All proceeds benefit the Cherry Hill Schools. Tickets are on sale now at www.cherryhilleducationfoundation.com. The Cherry Hill Alliance on Drug and Alcohol Abuse, together with the Cherry Hill Police Department, invite you to a special luncheon and prescription drug drop-off event from 10 a.m. to 1:30 p.m. on Monday, May 8th at the Carman Tilelli Community Center. Seniors can dispose of unwanted, unused and expired prescription medications, and then enjoy some fun BINGO and a free lunch. This event is FREE and open to residents 55 years and up (drug drop-off is open to ALL residents). You are invited to an “Author’s Talk” featuring Pakistani activist Sabeeha Rehman, 7 p.m. May 4 at the Cherry Hill Library. Ms. Rehman will discuss her book "Threading My Prayer Rug,“ one of Booklist's Top 10 Diverse Nonfiction Books of 2017. Event is free; registration is required. Call (856) 903-1227 or click here to register. Sponsored by the Cherry Hill Public Library, Cherry Hill Human Relations Advisory Committee, Jewish Community Relations Council of Southern New Jersey and the Pakistan-American Society Of South Jersey. Did you know that 90 percent of all addictions start in the teenage years? And 60 percent of teens who abuse prescription drugs start before age 15? While these may be frightening statistics, there are ways to safeguard your child from such dangers. Join the Cherry Hill Alliance on Drug & Alcohol Abuse at 7 p.m. Monday, May 8, at Beck Middle School for an interactive and informative discussion about Substance Abuse presented by William J. Lynch, Jr. Topics will include drug trends in our area; strategies to use to keep your kids safe and drug-free; and signs to look for to see if your child is using drugs. Becoming more informed could save your child's life. This is a free event open to all Cherry Hill parents and residents. For more information, visit the Cherry Hill Alliance on Facebook. It has been found that social relationships can affect our physical health as much as exercise, medicine, diet and other health-related factors. Studies have found a high percentage increase in survival of people with active social relationships. Positive relationships offer significant impact on health and happiness and are high on the list of protective factors for mortality. Cherry Hill provides a variety of ways to engage with others, from various senior clubs, which offer fun activities and interaction, to classes and programs (many free of charge or discounted for seniors) that provide the opportunity to learn something new and meet those with similar interests. With the arrival of the Summer 2017 Community Magazine and opening of summer registration, it's the perfect time to check out something new! Browse the Community Magazine online, or watch for the print edition in your mailbox in the coming days. Remember: The Township has a senior services program coordinator, Gaye Pino, available to answer questions about any issue or service of interest to our residents over the age of 55, including classes, activities, clubs, special events and housing. The coordinator is also a valuable resource and guest speaker for local senior groups and organizations. If you or someone you know is in need of assistance, call (856) 661-4800, or e-mail gpino@chtownship.com.